Detangling is one of the dreaded tasks that every natural must do if she wishes to properly maintain her hair but let’s face it- it can be a pain in the posterior. It is a constant battle between getting the tangles out and removing shed hair but not snagging the hair or over manipulating it. With all of this headache associated with this process I thought it would be helpful to give a thorough breakdown of the tools and methods that can help us get through this ordeal while keeping as much hair as possible on our heads and out of our combs and brushes. The Denman Brush is a detangling tool that's been around for quite some time now and has been reviewed extensively on CurlTalk. What makes it so popular is the efficiency with which it can detangle due to its somewhat flexible teeth and the fact that it can capture the shed hair to prevent your hair from matting. For some naturals whose hair can't tolerate all the teeth, the brush can also be opened to remove columns of teeth and make the spacing between them wider to minimize damage done to the hair. 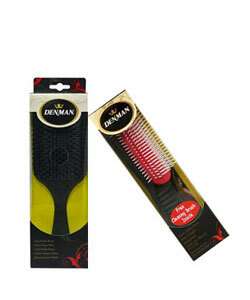 These brushes are commonly known as modified Denmans. However, if snagging is your primary concern then consider purchasing the D31 or the D41 as opposed to the popular D3 as it is better suited for detangling since its teeth are more widely spaced. Like most detangling tools, the Denman brush can wreak havoc on your ends if used too often without caution, which is why I prefer to use it as the final step on my hair to smooth it out before styling. In my opinion, the Denman is just about the best darn ‘clumper’ there ever was. Even my fingers can't create the smooth and elongated ringlets that my Denman can and I am not the only one who uses it for this purpose. There are plenty of videos on YouTube of women who do just that. Whilst your fingers may not be a tool per se, they do a great job at getting the tangles out. Because you are utilizing an actual part of your body it is easier for you to feel a tangle and gently pry it apart. Also it is easier to use the correct amount of force and adjust the distance between the “teeth” of your makeshift comb by widening or closing your fingers. It is the best option for persons with fine hair that splits and breaks easily. Also for frequent wash and goers this is one of the best ways to retain your curl pattern whilst washing to avoid having to use a lot of product to get it back. This by far is the gentlest way to detangle your hair but it is also the lengthiest. Most curlies who finger detangle can attest to the lengthy detangling times but then again they probably have the nicest ends. 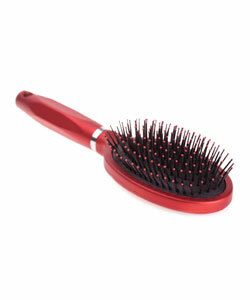 As a detangler, the Tangle Teezer does what it’s supposed to do very efficiently. The tangles literally melt because the teeth are extremely flexible. 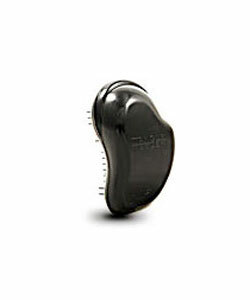 Instead of just getting stuck in the tangles or ripping them out, the Teezer gently coaxes tangles until they unwind. The noise it makes can be misleading. That scratching sound can freak you out a few times and cause you to periodically check the brush to check to be sure you haven’t ripped out a huge chunk of hair. It also does a decent job at catching the shed hair. My main issues with this product are the lack of a handle and the design and spacing of the teeth. I loved this product when I first used it and might have gone overboard with its use because the split ends appeared soon after. It was then that the rose colored glasses came off and I took a closer look at this brush. The teeth for one are not as smooth as I would have liked. Unlike the seamless teeth of the Denman and wide toothed combs, some ends of the teeth on the Teezer are jagged and could snag the hair. The teeth are also quite close together and you don't have the option of removing some of them for modification. I find it quite annoying that there is no handle. While I understand and appreciate what they attempted to do by making the teezer the perfect shape to fit in your palm, the design got really annoying in record time. When wet, the plastic it is made of becomes very slippery and the slip and slide game of the Teezer whizzing all around the bathtub begins. 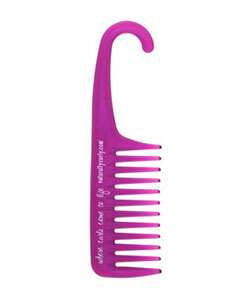 The wide toothed comb seems to be the most preferred product by many naturals for detangling. The reason it is so widely loved is because it can detangle efficiently and remove shed hair, while minimizing damagewith widely spaced teeth that are large and seamless. While on the subject of combs, an honorable mention must go to the Ouidad Double Detangler that has the same concept of a wide toothed comb however it has a second column of teeth that are staggered to maximize detangling. Although not a popular option, I still felt that this product should be mentioned. While the paddle brush does get the shed hair out, there are many problems with its design that make it unsuitable for detangling curly hair. For one, most paddle brushes have little balls at the end of the teeth which can snag on the hair. The teeth also don’t flex at all which can cause them to rip out tangles. They can also be quite large, heavy and cumbersome. It can be done in front of the mirror and out of the shower to make it easier to see and remove the tangles. There is less chance for breakage since the hair is strongest when dry. The oils and or conditioner not only act as a lubricant for easier detangling, but they also help to moisturize the hair to reduce the dryness and matting that shampooing can cause. When the hair is wet it is more elastic and it is easier to detangle. The conditioner and the water creates more slip than oil and conditioner. For maximum results, however, why not do both? A good dry detangling session before washing will help to improve your results when you detangle wet with plenty of conditioner after cleansing. Now that you have read about the different detangling tools and the methods, I wish you all the best in your detangling endeavors. How do you detangle? What are your go-to detangling tools and methods?